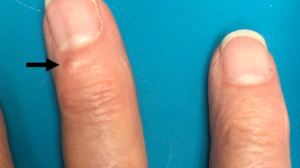 This 37-year-old man presented for evaluation of an asymptomatic purpuric eruption on both lower shins of a few days’ duration. 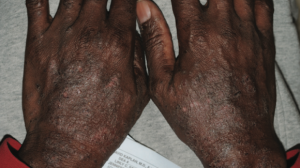 He was otherwise healthy and denied abdominal pain, chest pain, fever, and joint pain. 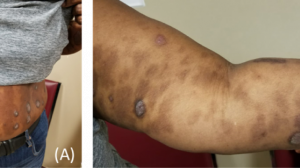 He had been on antihypertensive medication for years, and he had noticed some slight lower-extremity edema in recent months. 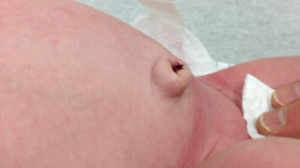 How would you diagnose these lesions? 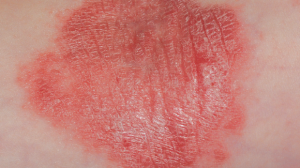 A biopsy would have confirmed the clinical diagnosis of lichen aureus. 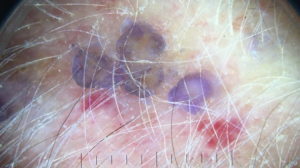 This less common presentation of benign pigmented purpura generally is seen in younger adults on the lower extremities. The etiology remains unexplained. This condition is characterized by the golden color, hence the aureus (Latin for “gold”) in the name of the condition. 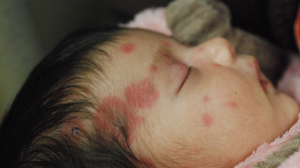 Schamberg disease generally is characterized by petechiae on the lower extremities. 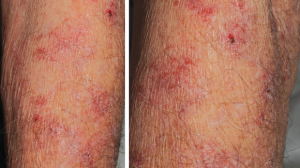 Drug-induced conditions and leukocytoclastic vasculitis usually are symptomatic and are more extensive. 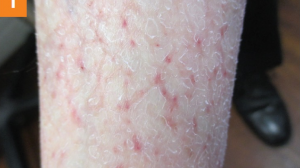 Lichen planus is characterized by flat-topped, purple, polygonal papules unlike what are seen here.